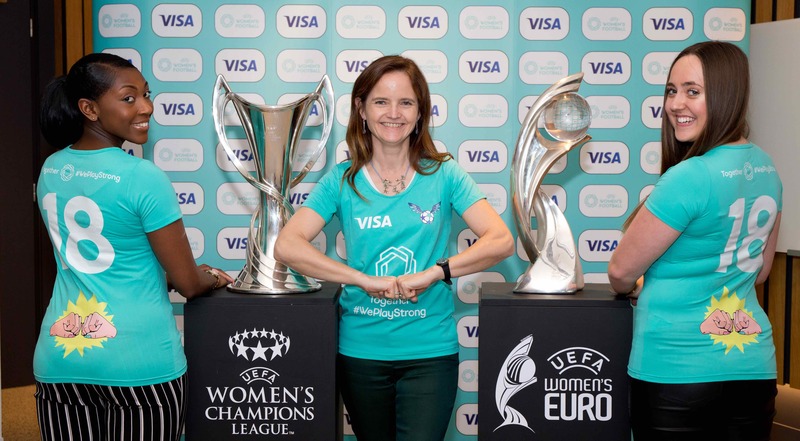 December 6 – UEFA Women’s Football has signed a landmark seven-year sponsorship with Visa that will run until 2025. UEFA split the sales of its men’s and women’s competitions taking the view that this would build the commercial proposition of the women’s game across the continent rather than as an add-on to the women’s game. The partnership with the global payments technology is the first bluechip financial sponsor to come on board for the women’s game. MasterCard is payments technology sponsor of UEFA’s men’s Champions League in a deal that runs through to end 2021. The Visa deal will cover all levels of the game in Europe from grassroots to the elite women’s game. “This will not only help to inspire current fans of women’s football but also ensure future generations take an interest in the sport. We are pleased Visa shares our vision for a vibrant women’s game,” said Epstein. As well as traditional branding and logo recognition, Visa will market via co-branded content designed to change the image of the women’s game. The Together #WePlayStrong has alread partnered with global popstar Rita Ora on her European tour and received nearly six million views on the Press Play vlogs – a series in which some of Europe’s best women’s professional players give an insight into their daily lives. No figure was given for the sponsorship value.